Having a brush cutter is going to make it easier to keep your garden clean in time for autumn, but there are other things you can do to further tidy it up. You may enrich it now with compost for one: just apply it evenly on the garden bed soil and with the aid of earthworms, it will improve the soil. Start by gathering dried seed from the vegetables and flowers and save it for the next year. It’s also a good time to clean the bird feeders: birds help get rid of garden pests so it only makes sense to keep the bird feeders enticing so they’ll keep coming back. While you’re cleaning, do the cuttings now before the cold season mushes up your plants. It’s also a good time to cut the perennials, especially the diseased ones, and get rid of excess foliage and dispose of them properly. Use your garden tools to remove leaves, cut grass and do general cleaning, and when you’re done, clean, oil and sand these tools before storing. Until the ground starts to freeze you should keep watering the shrubs and trees because they’re still alive, the appearance notwithstanding. Last but not the least, prepare your garden for the winter by turning off the pump and activating the ice breaker. To keep your garden clean during autumn you need some high quality tools for the job: no matter how diligent you are, it’s still necessary to get the best equipment possible. With the following, your garden should be more than ready when the leaves start to fall. One of the most powerful petrol chainsaws in the market today, the ECV 4501 is designed for homeowners who need a high performance utility. The ECV 4501 is powered by a 43cc (2.1 Kw) engine that not only works fast but reduces vibration and engine noise, a welcome departure from other chainsaws. The ECV 4501 also comes with a Dust Rejection Air-Filtration System that gets rid of the dirt in the air, which reduces the cleaning time and enhances the air filter’s life. The Tbc-340 is equipped with a 33cc, 2-stroke engine with chrome plated cylinder and a couple of piston rings that prolong the engine’s life. Complete with bearing support, the TBC-340 has a unique Anti-Vibration System with padded handles on the front and a mount between the shaft and engine. In addition the unit has a heavy duty steel shaft so power is transmitted smoothly and efficiently, plus 7mm drive system, 5 shaft bearings, clutch system heavy-duty centrifugal and the Walbro Diaphragm with Primer. The Trb65ef comes with a backpack harness that uniformly distributes the device’s weight, and it also has a 4 point anti vibration system for all day use, and there’s also a tube set on the throttle control, making it easy to adjust the air speed. 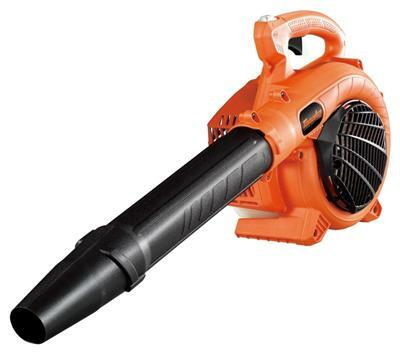 This petrol blower also has a generously sized carrying handle and a large fuel capacity tank.